Dust, moisture, oil and ear wax can all affect the working of your hearing aid, increasing the need for maintenance and possible early replacement. Here’s how you can keep your hearing aid working at its best. You should also have a user guide with your hearing aids, with instructions on maintenance. Keep it in a safe place for reference. Areas of aid to clean. The microphones, receiver and casing are all parts of the hearing aid where, if dirt, moisture or earwax is allowed to accumulate, it could affect the working of your aid, or shorten its working life. The microphones are where sound is captured. If there is any dust or dirt on them they will not collect sound effectively. Sound may be muffled or crackly. The Receiver is the part of the hearing aid that sends the sound into your ear, any blockage from earwax can stop this happening. If the wax works its way into the casing it can stop the hearing aid working altogether. The casing of your hearing aid should also be kept clean and dry. This is where the workings of the hearing aid are stored. Whilst many new hearing aids have a nano coating to protect them, they still need to be cared for to work at their best. This is a box with moisture absorbing crystals, designed to draw any moisture out of the hearing aid. This is for picking wax out of the receiver. Don’t use anything sharp (like a needle) to try and get the wax out. You could damage the ear mould or tubing and affect the hearing aid’s performance. You could also push the wax inside the casing. This is to clean the hearing aid shell and remove dust and debris. Hearing aid cleaning kits are usually available from hearing aid dispensers. Hearing aid wipes are also available for cleaning. Ask your audiologist before using these to make sure they won’t damage the coating on your hearing aid. It’s best to clean your hearing aid in the evening so you can leave it in the dri aid box overnight to remove any moisture. Before you handle your hearing aid you should wash your hands to prevent any dirt or oil transfer. Choose a workspace where your hearing aid won’t drop onto a hard floor or bathroom sink. A table in a well lit room is best. Have all your cleaning tools ready and remove your hearing aid battery. If you have a behind the ear hearing aid you can detach the tubing from the casing and use the air blower to blow out any moisture. You can also wash the ear mould in water but leave it overnight to ensure that it is completely dry before reattaching it. A wire loop can be used on BTE and In the ear types. Using the loop as a scoop, gently pull out the wax. Be careful not to push the wax further in as this can damage your hearing aid. If the wax is very sticky and hard to get out, leave the hearing aid in the dry aid box overnight. This should dry out the wax and make it easier to remove. Using the brush, gently brush the microphones to remove any dust and dirt. Continue to brush the casing as well as the battery compartment. Last of all, to prevent transferring any wax to other parts of the hearing aid, brush the receiver. Wash your cleaning tools afterwards so they are ready when needed. Keeping a regular hearing aid cleaning routine will reduce the likelihood of your hearing aid breaking down, and make it last longer. There are other things you can do to help with maintenance. Make up, face cream, hairspray, aftershave and cologne can all damage your hearing aid. When getting ready, put your hearing aid in last (after washing your hands) to keep it clean and dry. If you aren’t wearing your hearing aid for a while, store it carefully in its box and take the battery out to avoid leakage. If you work in a dusty environment, have very oily skin or have problems with ear wax, ask your hearing aid specialist about how you can protect your aid. 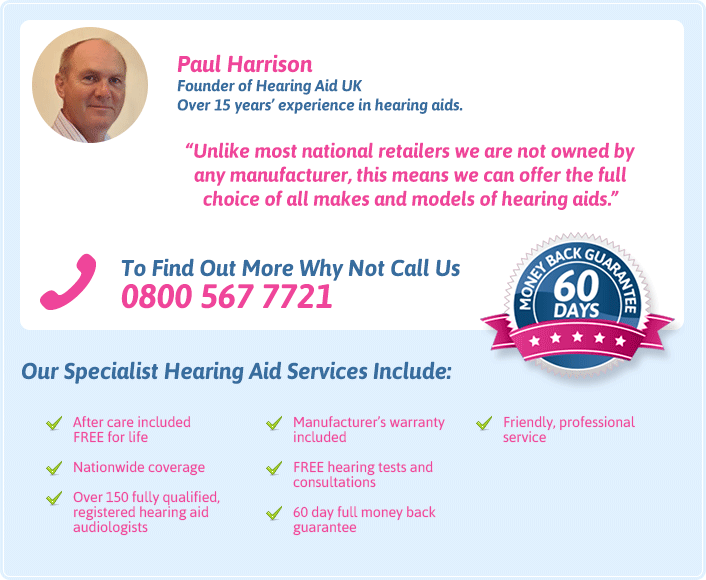 They may suggest you have regular appointments to remove earwax or specialist cleaning for your hearing aid. Your hearing aids are an important investment, with proper care and cleaning they should help you to hear better for a long time.